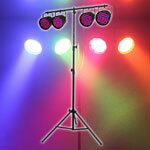 We've added another site to the AMPdj portfolio aimed at people looking for a wedding disco. Visitors can make an enquiry and it goes straight to our members in seconds! We've just added our useful planners for 2020 & 2021 in the members area. They are available in A4 and A3 sizes ready for printing off and marking with all your gigs! Our latest competition is launched with some great prizes including the Equinox Shard (shown). Our New 2018 web site is launched early with lots of new features. If your phone tariff offers free calls to landlines, or has inclusive calls or bundled minutes that cover calls to landline numbers, then calls to this number will be included on the exact same basis. Our Christmas 2016 Competition is launched with the chance to win one of 4 great prizes from Equinox and AMPdj. This competition is now closed - winners will be announced shortly. Ready for your 2019 enquiries/bookings? We've made preparing your annual accounts a lot easier with our Excel Spreadsheet especially designed with DJs in mind. All the columns will auto total so you'll soon see how much everything has cost you over the year. Exclusive Offer! Members can save 50% on new music subscriptions from CD Pool for 3 months. Our Christmas 2015 Competition is now closed..
Our Christmas 2015 Competition is launched with the chance to win one of 12 great prizes from Equinox and AMPdj. This competition is now closed - winners will be announced shortly. Our phone number stays the same and is at the bottom of each page. 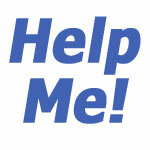 New free web site hosting package available for all current members worth £39.99 per year. New DJ Digest issue 2. In this issue we cover 'Removing Obstacles for Your Clients'. New DJ Digest launched for all mobile DJs. In this first issue we cover responding to the "How Much Do You Charge" question from clients. The popular AMPdj Spring Competition is back with some great prizes up for grabs! 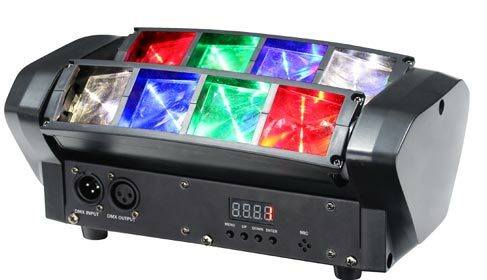 The winner can select from 3 Prolight lighting effects plus we have 5 runner-up prizes of DJ Hanks Really Useful Guide for Your Mobile Disco Business. We take an in-depth look at this question and provide some ideas about what the client is really asking. 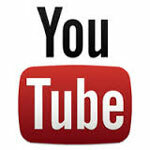 Do you make full use of promotional videos to help gain more clients? It's not 'All About the Bass', more 'All About the Books' in our last Mobile DJ Trade Tips for 2014. We look at several books which could be useful Christmas presents or stocking fillers. New University Course for DJs. Save £50 on the course using the exclusive discount code in the Benefits Section of the members area. AMPdj is pleased to announce that we are now a 'Registered Body Oganisation' which will allow us to process Standard & Enhanced DBS (formerly CRB) checks for our members. This will also include Access NI. Members can login to access all the information and necessary forms. We've teamed up with our friends at CD Pool to offer all new members a free downloadable sampler of tracks taken from the latest 'Ultimate Mobile DJ Pack' or 'Ultimate Club DJ Pack'. Click here for more information on each of these products from CD Pool. The option to request your free downloads is provided in the members area after registration is completed here. Thanks to all those mobile DJs who have purchased a copy of DJ Hank's Disco Book and helped us to raise over £1200 for charity (actually over £1500 as we've added Gift Aid). The Bank of Hank is now empty and if you want to help fill it up again and raise more money for these charities then you can purchase the book from Amazon, from the ProMobile Bookstore and from the AMPdj Goodie Store. Buying the book benefits these charities: Action on Hearing Loss, Diabetes UK, Multiple Sclerosis and Guide Dogs for the Blind. Phonographic Perfromance Ltd (PPL) have been active recently targeting mobile DJs, usually following up the initial call with invoices of over £375. We offer advice to our members, most of whom do not need the licence. More information in the members area. Our new user friendly, responsive and touch screen AMPdj site is revealed. This will make it even easier for members to access all the benefits of membership. Are you a proper DJ? That's the question we cover in the latest of our Trade Tips Infomails. You can read it in full here. Our AMPdj Christmas Competition is launched with 19 prizes to give away to some lucky winners. You can read reviews on all the prizes here and then enter for your chance to win one of them. Entries need to be in by Wed 20th November 2013 at 5pm. There are a few rules which can be found here. Our latest newsletter looks at the support that's available for AMPdj members. From telephone advice to a full review of your website or email response and from emergencies to paperwork - it's all free!! 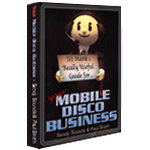 DJ Hank's Really Useful Guide for Your Mobile Disco Business is released as a paperback. In full colour with 40 chapters and over 180 pages, it's available from the AMPdj Goodie Store at just £11.99 + P&P with all profits from the sale going to four very worthwhile charities. We take a look at the forthcoming BPM show at the NEC, Birmingham in our latest newsletter. With less than 4 weeks to go before the doors open what can you expect and where can you find more information? Issue 55 of our Mobile DJ Newsletter looks at the various effects of the recent recession on Mobile DJs and prepares for the recovery and upturn in partieis and bookings. DJ Hank's book makes it to the Number One spot on the Amazon Best Sellers list for Music Business. Thanks to every who has supported this project so far. All profits from the book will be going to 4 very worthy charities. 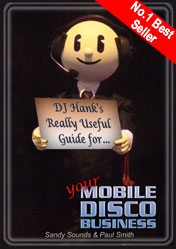 DJ Hank's book - 'The Really Useful Guide for Your Mobile Disco Business' is released. A look at dB Technologies Opera DX and Sigma series speakers. We review these in our latest Mobile DJ newsletter. Plus news of our latest marketing campaign to promote our AMPdj members to over 6,000 hotels around the country. You can sign up to these newsletters for free. AMPband is launched providing great benefits to Bands, Singers, Soloists, Duos, Trios, Musicians & Tribute Acts including £10m PLI underwritten by Royal & Sun Alliance. With membership at only £49 for soloists and from just £69 for full bands. Issue 50 already!! PLI, Why Bother? 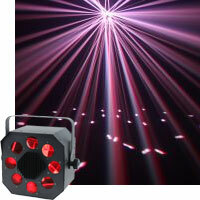 Why you need PLI when you operate a disco and the possible consequences if you don't have it. In issue 49 we take a look at the Pro Mobile Conference - with details of the seminars and speakers. Plus the winners of our Christmas Competition. Issue 48 'The AMPdj Christmas Competition' - with over £1,000 worth of prizes to give away this is our biggest & best yet! Issue 47 'The Write Stuff' - we take a look at writing professional copy for your web site and emails.. Results are out for the first Wedding Industry Experts Awards, and we are delighted to hear that AMPdj member Steve Roberts of Funkie Diva Discos was voted the winner of the Best Disc Jockey category in Scotland. Issue 46 'BPM 2012' - we look forward to BPM 2012 and look back at last year's show. Issue 45 'Love Your Ears' - advice from Action On Hearing Loss and protecting your ears as a mobile DJ. Issue 44 is published with info on Personalised Gobos for your events using PowerPoiint. Aarrgghh!! 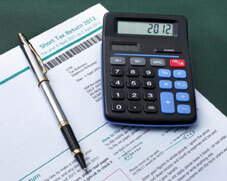 We look at income tax and self assessment in issue 41 of our free DJ newsletter. Read it if you dare! In the last 2 years AMPdj has provided enquiries and bookings for our members worth over £1,000,000. Every month hundreds of clients planning a party use our service to get directly in touch with their ideal DJ and every month our members reap all the benefits of being part of the largest national organisation for mobile DJs in the UK. With £10m PLI included, member support and other savings worth at least 10 times the membership fee it's not surprising that more and more mobile DJs are making AMPdj their number 1 choice. Adrian Flux Insurance Services are pleased to announce their support of AMPdj and we hope to be able to provide competitive motor cover to those members who may also use their vehicles in relation to their disco activities. Why choose the Adrian Flux Insurance Services? For the past 30 years Adrian Flux Insurance Services has developed into the country's leading agent for Specialist Motor Insurance, providing services dedicated to the specific needs of our clients. This enables us to offer all drivers competitive premiums and excellent service coupled with special discounted rates for AMPdj members. Our ‘specialist’ schemes enable us to provide very competitive premiums and added benefits such as free legal cover (£100K of legal expenses) and ‘Classic’ breakdown cover from only £34 for Homestart, and European cover. Why should a client pick you for their disco? We look at the options in our latest DJ newsletter plus a summary of just some of the latest AMPdj benefits. Putting Mobile back into Disco is our latest offering with some tips and ideas - out today! Happy Birthday to AMPdj! As we move into our 3rd successful year we're adding even more benefits. Client enquiries are also still increasing month on month too. Website plagiarism is covered in the latest mobile DJ newsletter - out today! Details of seminars announced for ProDJ UK on 8th May and we publish them in our latest newsletter at https://www.mobiledj.info/dj_newsletter_issue_29.html - see you there! Specialising in weddings for mobile DJs is covered in our latest newsletter to coincide with the refreshed and re-launched Wedding DJ Alliance at www.wdja.co.uk. If you specialise in wedding discos then take a look. We offer some multiple choice senarios in Newsletter 27 - see if you agree with us. Winner of the Showvision DeckSkirt announced plus two Perils of the Internet, Cybersquatting & Passing Off are discussed with advice on what to do. We also launch a new site and add even more AMPdj member benefits. A football song for Euro 2012 is already making lots of noise! AMPdj member Neil Philips has re-written the lyrics to a popular Black Lace song and features in the video too. You can view the results (& sing-along) by clicking the image left. All profits from the download go to 'Help for Heroes' so please give your support . Increasingly, venues are requiring mobile DJs to prepare and submit Risk Assessment forms prior to an event. We identify the risks associated with operating a mobile dico and provide ways to minimise them in a set of tables (available from the members area). 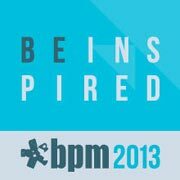 BPM is just one month away - if you don't have your ticket yet visit the BPM site for more details. DJ equipment stolen from Eastwood. Check out the list here and if you are offered any 2nd hand gear or can help in any way contact James using the details on the stolen gear page. We're one year old already! Thanks to our 100s of members for their support over the last year. I'm also delighted to announce that, just as we said at our launch, if we could hold the price of membership for a 2nd year we would - and we have! It's less than 2 months until this years' BPM Show at the NEC Birmingham. The BPM site has been given a makeover and you can read all about BPM 2009 and what's in store for this year. Time for another Newsletter - we're up to number 20 already and this time we take a look at our experiences when trying to contact DJs - it's quite revealing! So How Accessible Are You? Our 5th client enquiry site is launched. Thanks to those who suggested The New Karaoke Site. We thought it was a good idea too! Our 1,000+ mile trip around the country to visit local DJs is complete and was extremely successful. We're now back in the office where normal service will be resumed. The details of our 4 Local DJ Meet Ups are announced. On 7th June we'll be in Peterborough, 8th June Wigan, 9th June Barnsley & 10th June Glasgow. We look forward to meeting you. More details are here. We cover Your Personal Performance this time around with some ideas to consider including rapport, meetings, microphone use and behind the rig. 2 for the price of 1 this month - well actually they're free anyway! The latest offering is Expanding Your Mobile DJ Business - Part 2. 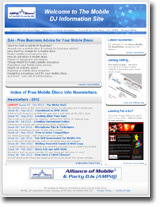 In this issue we look at other areas where Mobile DJs can increase their business and turnover. We take a look at DJ Organisations & Support in the latest newsletter. Included are SEDA, DJ/MC Academy, The DJ Business, BPM, Pro Mobile, WDJA, Disco City & The 'Orange' Forum. We're 6 months old today!! And what a time it's been - thanks to the 100s of DJs who have already joined - like us, you obviously know a great deal when you see one! Our DJ-PLI site will be regularly updated for both clients and djs, answering questions about Public Liability Insurance and providing useful information. PLI Validation for use by clients and venues is now available on this site as well as www.mobiledjdisco.co.uk. Members can choose which site to direct clients too for validating their PLI. The 4th & latest of our feeder sites to bring in client enquiries for our members is launched. The Birthday site has over 80 pages. SEO (search engine optimisation) has been top of the agenda again this week. We've analysed what has been working well on the sites and what needs improving. This is an ongoing project as the goalposts are always moving but we're at Number One for some search terms and want to stay there! The great thing about friends is that they keep your feet on the ground and tell you what they think - even if it's not complimentary! The answer is that each is marketed to different clients - we have an ambitious target and each site works independently to achieve this. The response so far from both clients & DJs has been fantastic and we intend to build on this for the benefit of both our clients and our members. What we aim for is to let the client choose the right DJ for their event - the sites, the method, the whole idea is designed to achieve this and experience shows it works!! Having said that - I am always more than happy to receive constructive criticism. Already some members have come forward with great ideas, improvements and suggestions - keep them coming because they are all welcome. Since its launch last month, AMPdj is the fastest growing Organisation for Mobile & Party DJs in the UK! Thanks for all the support, messages and suggestions. I was delighted to hear from one member earlier today - he has saved over £200 this week (& also has double the cover) by switching his two PLI policies to AMPdj and contacting our broker directly for his equipment insurance too! The two initial sites for client enquiries are ranking on the 1st page of search engines for over 100 of our targeted keywords & phrases. Another 1,000+ identified search terms are starting to climb and work continues to optimise these. A third site is completed & brought on-line to bring in Christmas Enquiries for AMPdj Members (see right). The initial 'launch' sites are being picked up by clients and enquiries are coming in daily across the UK. The Alliance of Mobile & Party DJs (AMPdj) is launched. With £10 Million PLI specifically for Mobile DJs and the opportunity to receive extra enquiries for your area. Two sites are included to bring in those all-important enquiries, with more sites planned for the very near future. 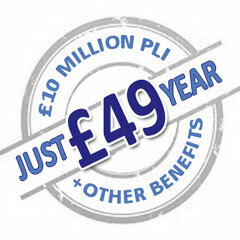 Membership includes enquiries for your area and £10 million PLI at £49 for a year - fully inclusive! After months of negotiations, the deal is finalised to offer Mobile DJs a great deal on Public Liability Insurance with the number 1 commercial insurance company in the UK.